On the ECA website you can scroll a list with all currently offered courses and conferences. The new WebApp does provide that list as well. Simply go on „GMP Courses & Conferences“ to access the complete ECA course and conference programme any time. If you just want to get a list with courses and conferences in a certain area, simply use the „GMP Search“ function decsribed before. And... by the way... if you found the programme you were just looking for... you can even register by using the App. Access to more than 1.100 GMP Guidelines This function is an exclusive service for ECA Members (Company Members will get access for all employees*). 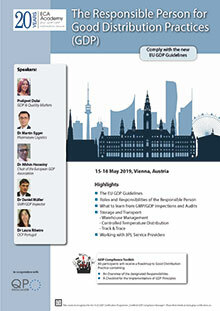 After login you will have access to all GMP Guidelines from EU/EMA, FDA, ICH, PIC/S, ICH, APIC, IPEC and WHO. To log in simply use your user name and password from your ECA Membership account. ECA Members have access to two so called Webtrees. One Guideline Tree is structured according to GMP topics. The second Guideline Tree is structured according to authorities. By using the Guideline Trees you can easily access the Guideline of interest.